The skincare industry is huge! However many men feel like they are being neglected by cosmetic companies when it comes to their skin. So let’s help them out! Enjoy the ultimate men’s skincare guide! Is there a difference between women’s and men’s skin? 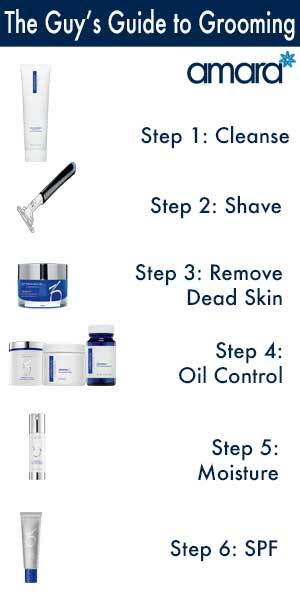 Men also see skin care as something that is more a quick fix for a problem rather than an investment! This may be due to there being less pressure on men about ageing, notably men are said to get to get more rugged with age while women are just said to wrinkle. Should men and women have different skin care? So there is really very little difference in the makeup of our skin! So is there a need for different skin care? Men’s cosmetic skin products are full of heavy and strong ingredients such as menthol or charcoal. These ingredients can be quite harsh and actually damage some skin types! What should my Skincare routine be? Well for starters do it Daily! So many men only use products when they have a issue such as Acne, it is important to have a set morning and night routine! Like with women – the same skincare won’t work for all men! However here is a basic starter plan that can be added to or changed depending on your skin needs! Due to beards and the extra hair follicles on their face men can build up more oil trapping bacteria and causing Acne. Cleansing morning and night is important to prevent bacteria from building up and also removing any dirt that built up over the day. Oilacleanse™ from the ZO Medical range contains Salicylic Acid – Perfect for removing Excess oil and preventing and treating Acne. Oilacleanse also contain exfoliating beads to encourage the removal of dead skin cells. When it comes to shaving it is important to use a fresh blade! Dull razor can damage your skin and of course not shave correctly, shaving in or straight after a shower can also help get a cleaner shave. Exfoliating the face will clean out clogged pores and also help reduce razor bumps or ingrown hairs. Offects® Exfoliating Polish from ZO Skin Health is an exfoliating scrub that uses crystals to improve skin texture and increase your cell turnover. This should be used about 2 times a week unless you have very oily skin in which case more often is recommended. Back to oil again! Oil control is a top priority so one extra boost is perfect for keeping your pores clean after shaving and exfoliating, particularly while you sleep. TE pads or Cebatrol Oil Control pads. These pads work to keep the skin clean and remove excess oil and prevent oil from causing Acne. Cebatrol pads have stronger strength of the acids and active ingredients compared to the TE Pads. Morning and night it is important to have something to keep your skin hydrated and help protect it throughout the day. A crucial step in your skincare routine is daily SPF! Even if you can’t see the sun the UV still shine through the clouds and damage your skin causing premature ageing. This SPF gives you full protection from the sun while not making you look like a ghost! What is your daily Skincare routine now? Do you have one?! Book in for a consultation for our Skin Health Specialist to keep premature ageing and razor bumps at bay!